My son and I are going to have a blast going to see the newest Star Wars movie ROGUE ONE wearing matching stormtrooper shoes that were custom made for us courtesy of SoulKix. 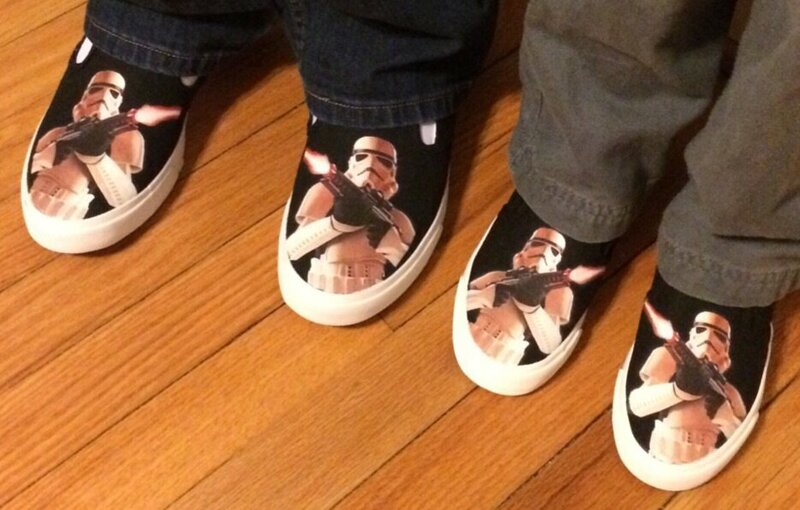 These shoes are impressive, most impressive! SoulKix understands everyone has their own sense of uniqueness and lets a people personalize footwear to express their individuality through some really cool looking shoes. If you want to create your own custom kix you really need to contact SoulKix. As you can see SoulKix can provide custom designed canvass shoes for both adults and kids! My son really got a kick out of us being able to wear matching kixs to a movie we've both been waiting all year to go see. It's no surprise that we picked a Star Wars motif for our shoes but you can pick whatever you want when you design your own pair. SoulKix allows you to print any image that can be uploaded online from your computer onto a pair of canvass sneakers. Submit your design and SoulKix will make it a reality. In addition to making shoes that let people show off their individuality, SoulKix is committed to helping the needy around the globe who may not own shoes have a good pair too. For every pair of SoulKix shoes sold, a plain pair is donated to Soles4Souls. This non-profit organization acts as second wave responders providing footwear to those in need during times of disaster. They also provide shoes to people in impoverished areas of the world in an effort to better their way of life. More than 6,000 shoes have been donated to this charitable effort by SoulKix. As you can see from the shoes SoulKix sent A Geek Daddy, they will do an outstanding job in producing your custom made shoes for you. Just go to the soulkix.com website and visit the "Design Your Kix" section. There you'll be able to select your shoe's color and size, select a layout, and add your images or photographs to add your own artwork to the shoes. Once you've approved the preview, they'll print out your shoes and mail them out to you. Easy as that! SoulKix wants its customers to "Think Outside the Shoebox" so your kix come with a handy bag instead of packed in a box. 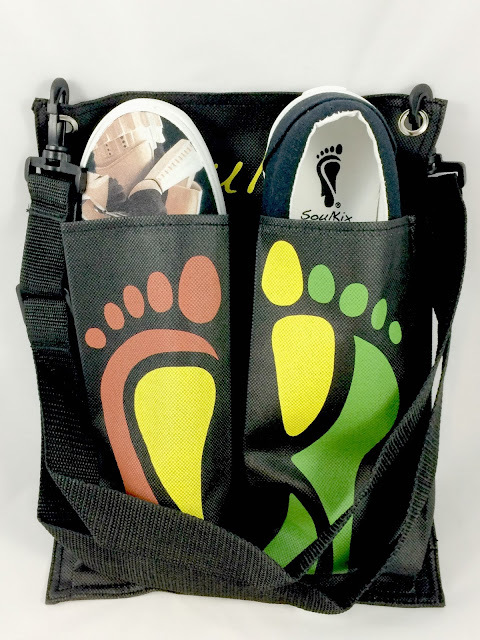 This bag sporting the SoulKix logo is made out of recycled materials, includes adjustable, removable tote straps and has shoe slots for you to carry, store, or hang your SoulKix in. The folks at SoulKix are fans of this blog so in addition to sending us some wicked awesome shoes for my son and I to wear when seeing ROGUE ONE: A Star Wars Story they also sent me some wonderful, personalized kix featuring the A GEEK DADDY logo. How cool is that?! aren't these some sweet shoes! I'll definitely be wearing these at some blogger events because they are sure to attract extra attention for A Geek Daddy's blog and social media channels! Whether you want to stand out in the crowd or highlight your own personality as you walk around, SoulKix are perfect for allowing you to differentiate yourself. Stumbling on what to give someone as a gift? Customized kix are a unique gift that even a hard to shop for person who has almost everything will appreciate. SoulKix are available in youth, kids, and adult sizes so they are just as suitable to wear for a 2 year old as a 102 years old. Head over to SoulKix.com right now to design your own custom shoes or to craft a pair for someone special in your life. These are really cool. I know my kids would love to get a pair. I think I'll check out their website. That's a pretty cool idea. I've never seen customizable shoes before. Those shoes are so cool! I hope you enjoyed Rogue One, and I bet you stood out with those kicks. Did you get some comments on your shoes at the movie theater? Those are so cute. I bet my daughter would put Henry Danger on her shoes!